Natalie Snyder has been taking top honors at competition for dives such as this one offthe 1-meter board. Natalie Snyder, a fourth-year biomedical sciences student from Rockville, Md., became the first RIT diver in program history to earn All-American honors, placing fifth on the 1-meter board at the 2016 NCAA Swimming and Diving Championship in Greensboro, N.C. 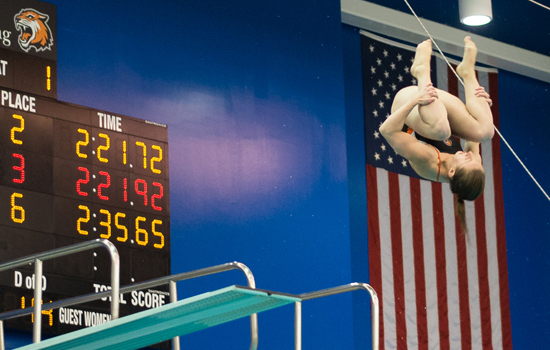 Earlier in the season, Snyder became RIT’s first diver to win the Region 4 Championship. Overall, Snyder won 13 of 14 events this season in the 1-meter, including the Liberty League and UNYSCSA Championships. Snyder is RIT’s record holder in both the 1-meter and 3-meter six-dive events. All the more impressive is that Snyder missed her freshman and sophomore seasons at RIT while rehabbing a torn labrum and torn triceps. “Natalie’s All-American finish is a testament to her incredible work ethic and mental toughness,” said RIT diving coach Cliff Devries. Snyder, who serves as an ambassador and tutor for RIT’s National Technical Institute for the Deaf, will graduate with a bachelor’s degree in biomedical sciences with a minor in exercise science in psychology, was a Outstanding Undergraduate Scholar in 2015 and will start graduate school in the fall at Maryland Eastern Shore with the goal of becoming a physical therapist. For the first time in five years, the RIT bowling team clinched a trip to the United States Bowling Congress Intercollegiate Team Championships. The team will travel to Dayton, Ohio for the championships, held on April 17 to 20. RIT is hosting a special viewing of To Err is Human: A Patient Safety Documentary, which investigates the struggle within the U.S. health care system to prevent medical mistakes. An expert panel discussion will follow the documentary.